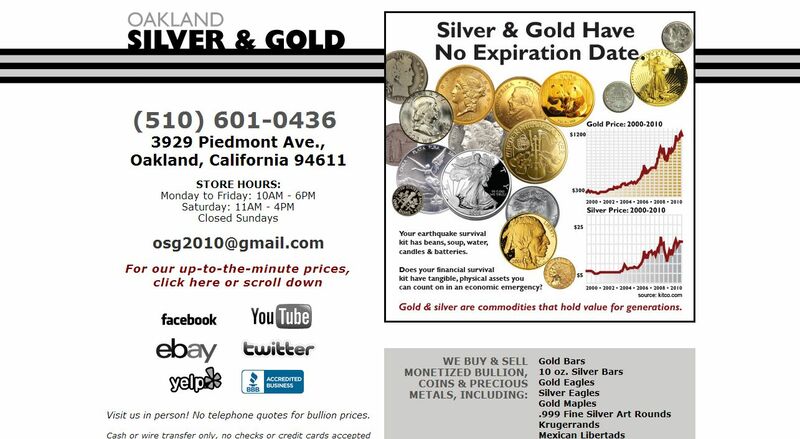 Oakland Silver & Gold address, phone, website, hours of operation, and more. We buy and sell all amounts of gold, silver, platinum and palladium, Krugerrands, American Eagles, Maple Leafs, all Foreign Gold, 90% Sliver Coins, Bars, Rounds & more. $10 or $1,000,000, our friendly service is the same. Bring your coins and bullion to us for on the spot appraisal. We offer the highest prices and pay by cash, check or bank wire. Private appointments arranged for large estates. We proudly feature a broad selection of .999 fine silver bullion limited edition art rounds, designed and minted in California. With our direct access to a private mint, we always have a large inventory of art rounds and we can easily fill the largest orders fast. We carry an assortment of “high end” investment grade coins for the collector and investor.